Do I like getting messy... you betcha... the messier the better... it's the cleaning up I don't like. I haven't taken part in Margarets Dress it up challenge for ages... despite the best laid plans... I get sooooo sidetracked :D There are just sooooo many things I want to do and try that there just aren't enough hours in the day!! I love sloshing paint around and made a background using acrylic paint... pva glue... watercolour paint and inks. Placing the colour randomly on the sheet along with the glue. Then I bubbled it with a heat gun... it's really cool doing that... magic before your eyes... just love the texture it creates. 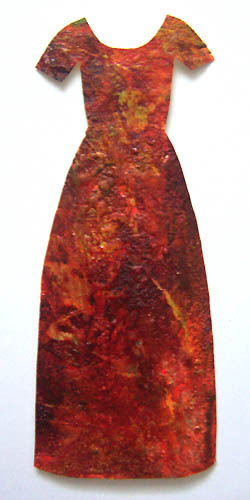 I then just cut out the dress shape from the piece I painted and shaped it a little so it didn't look flat. To see the other dresses for October go here. Hi Chris Love those colours sounds like you had fun creating this, gorgeous. Gorgeous dress, Chris! And it is sooooo autumnally (is that a word?!). Love the bubbling - I'll have to have a go at that too. Great color and texture on this dress! Not only do I LOVE this dress, Chris, I also love the texture. I may just have to try this technique which is totally new to me. Good to see you back playing with dresses, too. Oh wow what an amazing dress. Absolutely stunning structure. Love it. This is stunning-I love the texture you've created-Thanks for telling us how you've done it! Fabulous dress - great colours and textures, and the main thing - it sounded like a lot of fun making it! The colors are gorgeous and I really love the texture of the dress! Really beautiful. So glad you've joined in again! Beautiful slinky dress Chris, just perfect for an autumn walk in the park and then huge frothy capochino and something chocolaty! I tried this technique yesterday, Chris. For the life of me, I couldn't get my paper to look anything like yours. It bubbled, but just went flat again when the heat was turned off it. I varied the amount of paint I used on the paper, then varied the glue, then tried all kinds of glue/paint combinations. Nothing came close to your results. 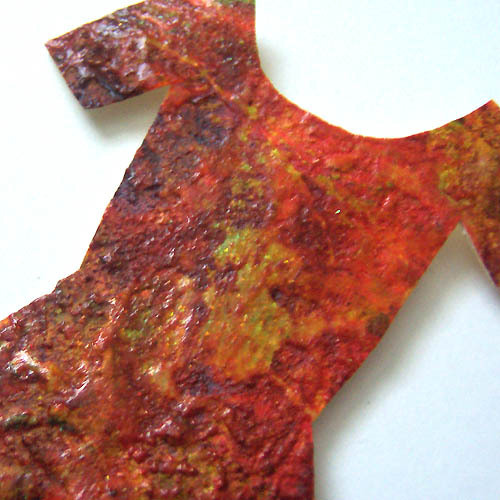 Love your rustic dress, sounds like a great technique..
Wow - it's dress art ! What a wonderful technique! And it has resulted in such a gorgeous gown! Great dress.